These guys have been a long standing source of inspiration in suburban Adelaide. Even growing up in the country I have vivid memories of them coming to our local agricultural show to perform. The experience left me dreaming of being a Skid Kid for a good decade or so. This week it's their birthday and there'll be a little ride across to Findon to check out their action and help them celebrate. 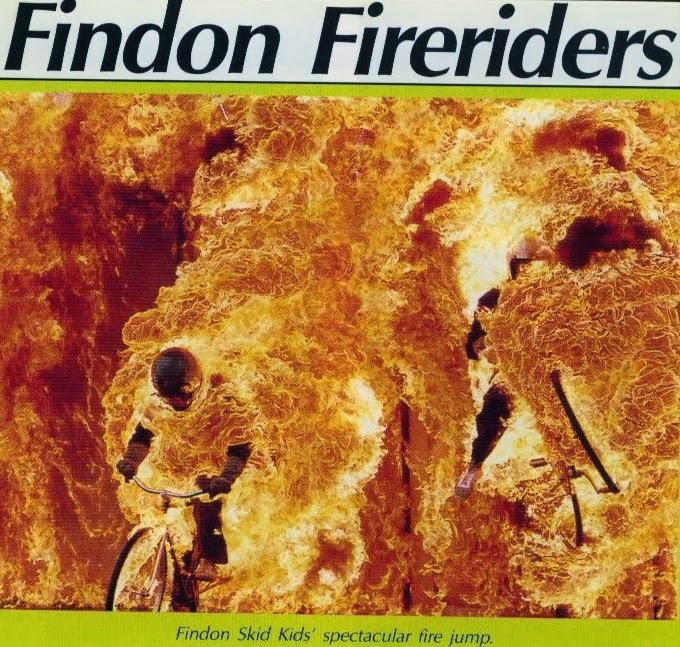 If you are not so familiar with the legend of the Findon Skid Kids, do yourself a favour and check out some of their history here. Also, for your viewing pleasure I have included a short doco produced a couple of years ago by Tilt Vision. Cycle Speedway racing is truly exciting and whilst some of you may have seen footage playing as late night gap filler on local television, this does not do justice to the adrenaline filled action that goes down on the track. Nor does it do justice to the culture and families whose lives revolve around Cycle Speedway. FINDON SKID KIDS - Both Sides Of The Track. from Tilt Vision on Vimeo. Oh, did I forget to mention that they also like to jump through walls of fire? !